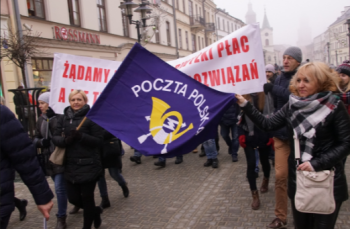 On March 23, the HR department of the Polish Post Office sent a letter to the management of the branches instructing them to bother workers about the necessity of caring for the good of the employer. This refers to the activities and protests of postal workers which the management has been trying to squash through scare tactics and repression, including the dismissal of one mailman and the possible dismissal of another. In relation to the posts put on social media and the Intranet which have offensive comments about managers or their co-workers and into order to extinguish operational risks connected to the workers showing posters about raises during working hours, with the logo of the post office in the background, we inform that the above actions constitute a serious violation of work duties. These violations are set out in art. 100 para.2, pt. 4 of the Labor Code, which is the duty to care about the work place, which is connected with the widely understood interests of the employers (not only financial, which is connected to the obligation that the worker be loyal to the employer. In light of the above, we ask that you make the workers aware and to take disciplinary measures against those who personally took part in such actions. The workers should be made aware of the fact that the good name and interests of the Post Office have been violated and to inform them that the employer, in justified situations, can terminate the employment agreement for reasons related to the fault of the worker.